Cork | Comics I Don't Understand - This site is now being updated daily at http://www.comicsidontunderstand.com. Please change your bookmark if necessary, and notify any web site with a link to the old address. No, that’s a credit card, coming out of a wallet. The point being – it often happens that when the waiter comes to get the bill, there’s this weird moment when more than one person wants to be generous and “get” the bill. Of course, neither wants to get the bill, but they want to be seen as being generous more than they want to let the other guy pay, so… But if they both get out their wallets at the same time, this horrible conversation ensues: “Let me get this”, “No, I insist”, “No, really”, “No, last time you got it…”. So, the guy on the right has been practicing and can now give the waiter his credit card so fast that not only the other potential payer is left standing in the dust, but the waiter gets one (literally) upside the head. I agree with RonObvious’ assessment, but I don’t understand why the card takes such a deeply curved flight path. Because he’s JUST THAT GOOD. 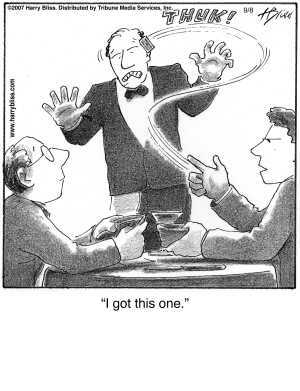 I don’t really understand the point of this strip, but it seems like the waiter is trapped in a mime box, and Man-On-Right is trying to slice him out. Yay! Cards tend to flutter in flight, is all. Usually not THAT much, mind you. I think he’s channeling Oddjob throwing that lethal bowler hat in Goldfinger. The card is either hitting the side of the waiter’s head with the back of the card or impaling the waiter with the bottom of the card. The perspective or proportion of the card is off, either way. To me, the credit card appears to have ricocheted off the waiter’s chest, flip over, and then travel back towards the guy who threw it, make an in-flight u-turn, and travel in the opposite direction as it flips over, before hitting the waiter upside the head. What we have here is a magic bullet credit card. Perhaps it’s supposed to be a pun. “I’ve got this one” meaning both that he’s taking care of the bill AND that he *got* the waiter.